In December (2014) I posted here (PDF background colour fix with latest Adobe updates) that a long-standing PDF accessibility problem, namely a serious background colour bug, had been eliminated with an update to Acrobat/Adobe Reader 11. However, the problem then reappeared with the release of Acrobat DC, was fixed in a subsequent update, but has since returned once again in Acrobat DC (last updated October 2017). It remains fixed in Acrobat 11. Graphic designers working in InDesign will need to be aware of it and to work around it. Here’s the problem. Background colours that cover less than 50% of the total area of a page are not recognized as backgrounds when the user selects a custom colour scheme. The screenshot below shows a single PDF page. It is divided into two text frames, each with a single line of black text on a yellow background. 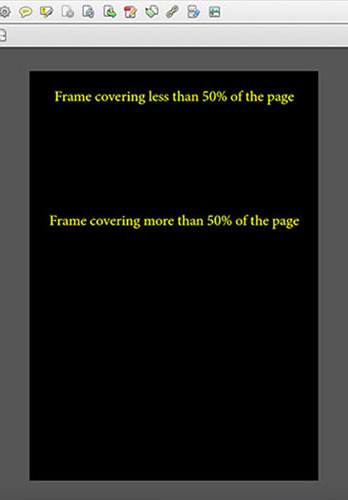 Notice that the first frame covers less than 50% of the area of the page, whilst the second frame covers more than 50% of the page. In both frames the text will be yellow and the backgrounds black, as intended. The larger frame is handled without any problems, but DC fails to convert the background of the smaller frame correctly, resulting in yellow text on a yellow background. As mentioned in my previous post, there is a workaround for this in InDesign (using Paste Into) but there is no workaround when creating PDFs from Word, Libre Office or Open Office. Hopefully Adobe will address this problem soon, but in the meantime this is once again a problem that document producers need to be aware of.